From 1994 to 2001 these were adapted into a series of 9 light novels. An anime film was released in 1996, followed by a 148-episode anime TV series from April 1997 to December 2000. There was also a live film in December 1997. 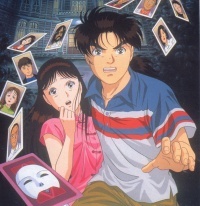 A second manga series called Akechi Case Files was released 1998 to 2000 (overlapping with "Short Files" and "Case") and compiled into 2 volumes. A second anime film called Satsuriku no Deep Blue was released in 1999. Three anime TV specials were also released as supplement to the TV series in November 2007. A 2-part OVA series called Kuro Majutsu Satsujin Jiken-hen meaning The Black Magic Murders was released 2012-2013. A third manga series called Takato Case Files was released 2013-2014 and compiled into a single volume. A second TV anime series called Kindaichi Case Files R released April to September 2014. Miyuki Nanase attempts to take a Bath in the Clawfoot Bathtub in her hotel room at the opera house but sees that her ceiling is leaking and afterwards everyone finds out that it was coming from Natsuyo Ogata's room where she is seen dead in a Blood Bath inside of a clawfoot bathtub that was still running. It was a set-up to make it look like she drowned in the bath but she was really beaten to death and put into the bath naked to cover up the murder into looking like an accident. Miyuki Nanase takes a Shower in a Clawfoot Bathtub at the Opera House Hotel and then the Shower Head ends up spraying blood. Natsuyo Ogata is seen dead in a Blood Bath Clothed inside of a Clawfoot Bathtub. Kindaichi barges into Miyuki Nanase's hotel room who is wearing a Towel after some Off Screen Bathing and gets mad at him. Miyuki Nanase takes a Shower. Hajime Kindaichi and Miyuki Nanase investigate the ski resort and find signs that Natsuki Kumosawa who has been missing took a Bath Off Screen and didn't dry her hair. This page was last modified on 30 March 2016, at 06:59.